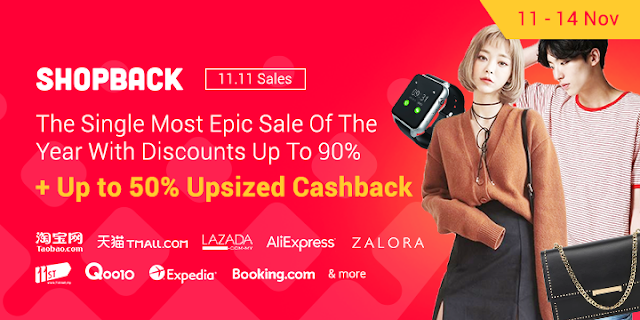 [ShopBack Shares: 11.11 Sneak Preview] Lazada increases Cashback to up to 22%, 11street presents up to 6% upsized Cashback, Taobao up to 50%, and find out more from the others! ShopBack-Exclusive 11% off voucher code for all Lazada customers (capped at RM90, limited quantities and not applicable to flash deals. Code available via https://www.shopback.my/1111-sales on Nov 11th)! Download ShopBack's NEW Cashback Buddy, search in our drop-down search bar to discover Cashback items in Taobao & Tmall! You will also be seeing famous sites like Booking.com, ZALORA, Fave, Qoo10, Photobook Malaysia, ASOS, Charles & Keith, Kinokuniya etc increasing their Cashback offer on the day itself too. Shop your travel, electronics, household and everyday needs through ShopBack, and save more money via The Smarter Way!